first appeared in Grand Valley Magazine, 2008. I was born in 1948, of second generation Americans, of German & Swedish origin. I read at an early age, (5th grade level in the 1st grade) & wrote my first poems at the age of ten. In high school, I was the literary editor of the school newspaper/literary magazine & the winner of the annual school literary contest four years in a row for my poetry. After graduation, I joined the U.S. Coast Guard & became a member of a search & rescue team, first on Lake Superior & finally on Lake Michigan. I wrote my first novel (The Whole Thing) at eighteen. After honorable discharge from the U.S. C.G., I attended Grand Rapids Community College. I married Pam Wilbur in 1969. Our son Kris was born in 1980. Along with poet Ronnie Lane, I founded Metamorphosis, a literary magazine in 1968, & was its editor for the first five issues. My first poetry chapbook, Earth Songs, was published in 1970, followed by Canary Wine, Milk Run & Other Poems, & Sand & Other Poems, the last a full length, hardcover book. After transferring to Grand Valley State University, Lane & I established Pilot Press Books. Ronnie & I were also the founding editors of Grand Valley's national literary magazine, Amaranthus. We published a wide cross-section of poets early in their careers, including Diane Wakoski, Etheridge Knight, Dan Gerber, John Jacob, Donald Hall, Kirby Congdon, Thomas Fitzsimmons, Herb Martin & Christine Zawadiwsky. I was the poetry editor for the first seven issues. In 1971, I attended the 1st National Poetry Festival on a fellowship & spent a week with many of the major poets of that period. I had intensive workshops with Robert Bly & Ted Berrigan (separately) & got to interact with many poets, including Gregory Corso, Robert Creeley, Paul Blackburn, Robert Kelly, Al Young, James Wright, Diane Wakoski, Sonia Sanchez, Jerome Rothenberg, Joel Oppenheimer, Jackson MacLow, Tom Weatherly, Anselm Hollo, Phil Whalen, John Logan, Armand Schwerner. The next year, the college brought in Allen Ginsberg, Diane DiPrima, Lawrence Ferlinghetti, Charles Reznikoff & many others. All these exposures widened my view. I became active on the national small press scene, publishing in over a hundred of the magazines of the seventies & eighties such as Duane Locke's U.T. (University of Tampa) Review, Menke Katz's Bitterroot & the initial issue of Stone Drum (Huntsville, Texas) that also included poems by Ted Berrigan, Robert Creeley, Robert Bly, William Stafford, Phil Whalen, Vassar Miller, Tom McKeown & Sonia Sanchez. I graduated from GVSU with my BA in English in 1972. I was published in a Beacon Press anthology edited by Walter Lowenfels For Neruda/For Chile in 1975, just before Walt's death. He was a major correspondent. I was close to Donald Hall, & spent days with him at his home in Ann Arbor, arguing about poetry. Ronnie Lane & I did a series of chapbooks & full length books through Pilot Press Books, including works by Herbert Woodward Martin, Kirby Congdon, Ben Tibbs, John Woods, Thomas Fitzsimmons, Al Drake & two popular anthologies, 10 Michigan Poets & Face The Whirlwind. In 1973 Ronnie & I split amicably, with me continuing as editor & publisher of Pilot Press, & Ronnie forming his non-profit Free Books, Inc. Free Books was the original publisher, in 1974, of my Rimbaud translations. They also published a small chapbook of my ghazals, Black Milk (1974). I was a book reviewer for the Grand Rapids Press, Michigan's second-largest newspaper, from the early seventies to the mid-eighties. 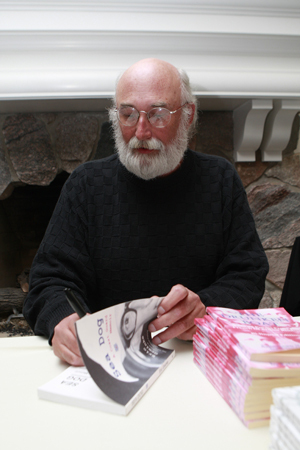 I exposed numerous poets to a mass audience in Michigan in my reviews, including Charles Bukowski, Robert Creeley, Nikki Giovanni, Diane Wakoski, F.D. Reeve, Tom Clark, Joe Brainard, & Clayton Eshleman. I also accepted an offer from Grand Rapids City High School to teach Poetry Writing, from 1974-76. After that, I taught in the Michigan Poets In The Schools Program. I also managed a large bookstore during this period. In 1977 I decided to become a social worker & returned to GVSU for a second BA degree, in psychology. I went on to graduate school immediately, in pursuit of an M.S.W. degree. My first social work job was working with emotionally disturbed adolescents through Catholic Social Services in Grand Rapids. After earning my Masters degree in Social Work from GVSU, I went to another program for disturbed children named Riverview Residential Treatment Facilities. I did group & individual therapy. In 1985 I divorced my first wife & married Roseanne Ritzema. Our daughter Anna was born in 1989 & our son Karl was born in 1992. For two decades I worked with neglected children & their families, & then with developmentally disabled children through the Kent County Community Mental Health program at Kent Client Services. During this time, I continued to write poetry, fiction & non-fiction, but I didn't send much of it out for publication because social work demanded all my time & energy. I was ‘on call' 24/7, to deal with crises. I retired from social work in 1995. I had a backlog of unpublished writing. The oldest manuscript, Whole Self / Whole World - Quality of Life in the 21st Century, was a work of social criticism which I began in the early seventies & ultimately took twenty-five years to complete. In 2003, The Art Of Natural Fishing was published, followed in 2004 by my novel Sea Dog - A Coast Guard Memoir & my book Whole Self / Whole World - Quality of Life in the 21st Century. Selected Poems 1972 - 2005 was published in 2005. In 2006 I expanded my Rimbaud translations to a full length bi-lingual book, The Drunken Boat & Other Poems From The French Of Arthur Rimbaud. All these books generated widespread critical praise. All are still in print except Whole Self/Whole World, which topped out at 1,000 hardcover copies & has yet to be reprinted in paperback. In 2005 we also started Presa magazine, with Hugh Fox & Harry Smith, which has now had seven issues. I began sending poems out for publication again in 2006, & published my new poetry in over forty magazines within the next two years. These were recently collected in Wild Strawberries, published in the summer of 2008. I continue to write in several genres. I am currently marketing a children's book & rewriting another novel. Poetry comes uninvited & leaves just as abruptly, defiant of attempts to control it. I am 'on call' for inspiration. I generally write in a small cabin I built myself, located behind our 105 year-old lake cottage on the edge of a pine woods. The cabin is only 12' X 14', but has a 15' cathedral ceiling. It's a quiet space, with no distractions. It has no electricity, so light comes from the windows & an oil lamp, & heat from a propane stove. The walls are all varnished woods - cherry, oak, pine & spruce. I write on an old porcelain-topped table that we rescued from the cellar of our cottage. There are five windows that look out on pine trees & sky. Fifty years. I wrote my first poem at ten, at my mother's request. I had been running crazily around the house & she had a moment of desperate inspiration based in the fact that she had already instilled a love of poetry in my sister & me by reading it to us before bedtime regularly. The poem I wrote that day was unusual for a child because it was imagistic & unrhymed. Once that door of perception was opened, there was no closing it. By twelve, I was walking around with a giant copy of the collected poems of Keats & Shelley & reading Allen Ginsberg. I had a strong grounding in American transcendentalism in high school, & it's lasted my whole life. Thoreau's philosophy has had a profound effect on me. I have also been inspired by humanistic & existential psychology, particularly that of William James, Carl Jung, Fritz Perls, Erick Fromm & Rollo May. Zen has also been a major influence. My main inspiration comes from the contrast between nature & human nature. You have published numerous books. Please talk about them and your latest book Wild Strawberries. All of my books try to get beneath the surface of things, for I am a slave of irony. In this light, one theme or concern that I've become aware of is human nature versus larger Nature. I've always been concerned about the nature of man, & how we fit into Nature. Another related theme is that things aren't always what they seem to be. I'm concerned about perception versus reality. I think there may be magic hiding beneath what we normally consider the mundane. I think poetry has a unique power to penetrate, to open doors of perception into a deeper, more wholistic vision. In my most popular book, (available at Target, for godsakes) The Art Of Natural Fishing, I used fishing as a metaphor for how we live, & contrasted the materialistic approach to a more Zen-like one. I used a narrative that describes a master-student relationship, in homage to two quintessential classics, Isaac Walton's Complete Angler & Thoreau's Walden. In Whole Self/Whole World - Quality of Life in the 21st Century, I tried to address my social concerns directly, without metaphor. I worked off & on for twenty-five years on that one. I kept re-writing it, reformatting it, until it finally clicked. Sea Dog - A Coast Guard Memoir (Presa Press, 2005) is a novel written in the form of a memoir. It's in the first person, naive, in homage to Mark Twain. It was easy to write, because 90% of it actually happened to me while I was in the Coast Guard. Although I call it a novel, it's actually creative non-fiction. My collection of Rimbaud translations (The Drunken Boat & Other Poems From The French Of Arthur Rimbaud, Presa Press, 2007) is another book that evolved over several decades. I did the initial translations when I was in my early twenties. Robert Bly & others encouraged me to do more. Word built over time, & for each new edition I added six to eight new translations. The current (4th) edition is bi-lingual. The translation process for me is more like channeling or trying to tap into the original energy that inspired the poems. I was pleasantly surprised that some of the critics were able to deduce my intuition-based methods. It's always gratifying to be understood. In my poetry, I explore nuances & try to open perceptual doors. I try to put layers of meaning into it, yet keep it simple on one level at least. When people ask me which of my books is my favorite, I usually say "the last one." So, I'm still quite excited about Wild Strawberries & the even the newer one you're publishing, Catching The Light - 12 Haiku Sequences, a collaboration with John Elsberg. But, we'll wait until people have seen it before we comment on that one. Wild Strawberries collects the poems written since 2005. Each poem in the collection was published first in a litmag or on the web. It's satisfying to see them together, greater than the sum of parts. The major theme is that life can pass us by unless we are willing to stop & smell the roses, an age-old theme that still bears repeating in this period of decaying values, nihilism & social chaos. In the first section (Wild Strawberries), the question of how we can be close & alive together in the face of time, space, alienation & decay is the prevalent theme. The magic of Nature is contrasted to our human ability to perceive it & to the inevitability of decay & death. In the second section (Edges & Spaces), a flood of images are presented, related in a non-linear manner, but nonetheless related. In my ghazals, I use a free association that frees the images up from normal thought processes. Bly used to always talk about leaping in poetry - associative leaps that reveal deeper meanings. This was his greatest influence on me, though we now disagree on the use of the ghazal form, which seems to me a contradiction on his part. So, section two draws the reader in deeper. The poems in section one are more accessible, more obvious. Section three (Lonely Planets) goes back to structured free verse, but the poems are more expansive & mysterious than those in section one. Section one is more objectivistic, whereas section three uses more personal symbols. Whereas the first section tries to get beneath the surface of things to see the hidden magic, the third section deals with spatial relationships & connection versus disconnection, not only between individuals, but also between man & Nature. Again, the theme is seeing with new eyes, new perception. Finally, section four is the 180-line poem For The Living Dead, the best long poem I've written. (Nominated for a Pushcart & also as Best Poem of 2007 by Muses Review.) For The Living Dead is a subtly complex work that balances humor & despair, the sacred & the profane, into a unified whole that works symbolically rather than through traditional metaphor. It both contrasts & balances inner & outer personae. The language ranges from prosaic to poetic, again, reconciled by the total effect. As for new work since Wild Strawberries, in addition to the Catching The Light haiku, which took about seven months of collaboration with John Elsberg, I also collaborated on two chapbooks of a more experimental nature with Mark Sonnenfeld (Get It, Marymark Press, East Windsor, NJ. ISBN 978-0-0798819-0-9, 2007) & Richard Kostelanetz (PO/EMS, Presa Press, 2008). I also have a collection of children's poems, Worms Are Delicious, illustrated by Ronnie Lane, making the rounds. I also have a novel that needs yet another re-write (Elephant's Graveyard). So many projects, so little time! What year did you start Presa :S: Press? How many titles do you publish a year? What type of work do you look for? Presa Press was started in 2003. In a five year period, we have published eighteen bound books, sixteen chapbooks & seven issues of Presa magazine, totaling 3,264 pages. Now in our sixth year, we average four books, three chapbooks & two issues of the magazine per year. We look for work that pushes the envelope in some way, whether that be the social/emotional boundaries, linguistic boundaries or perceptual exploration into unknown territory, done artfully. You also publish a magazine called Presa. What year did the magazine start? Who edits it? How many people do you have involved with the magazine? We started Presa magazine in 2005. Editorial contributions are made by Hugh Fox, Harry Smith & myself, but the lion's share of the work is done by Roseanne Ritzema, who has been promoted to editor as of the next issue (#8). Larry Hill has completed his internship as our editor & wants to start a new small press of his own. We also have a production crew made up of two brothers, Jim & Mark McMullen. I still make the major decisions, but Roseanne & the McMullens do all the hard work that makes Presa & Presa Press possible. Speak about what the small press is today. What challenges do you think we all face? The small press today continues to be where the pure poetry is published, but the sense of common purpose has lessened, compared to the spirit of a movement that we had in the sixties & seventies. I believe the levels of talent & commitment are high, but things are much more competitive among the newer presses & journals. I think a business model has taken over to some degree. I also see the effect of the proliferation of MFA programs. There is no way to become an instant poet. One must work it out by oneself & it's a process that interacts with real life experiences. MFA programs insulate students from the struggle of real life to a degree, & also tend to over-analyze & intellectualize what is essentially a non-rational, creative process. The challenge for today's publishers is to recognize & publish the genuine article, as I perceive you are doing with Červená Barva Press. I also believe that with the growth of MFA programs there has been a concurrent growth of university presses which cater to that niche & tend to squeeze out the independent presses in competing for bookstore shelf space. Distribution continues to be a major challenge for the independent small publishers. I also think a certain degree of eclectism is a value we should promote. In this way, poetry can promote diversity & tolerance. Historically, the great poetry from any given period has come from the independent literary presses. No major poet has ever been a professional English teacher. We in the small press are carrying & nurturing the future of American literature no less. You and Roseanne publish so many books. Do you do the layout all yourself? Talk about your process. We do all the layout & design ourselves. I have personally designed all the covers, with graphic help from my daughter Anna, my son Karl & Roseanne. We also do most of the actual printing. The McMullens do the bindery work & some of the printing. When we get a manuscript we want to publish, we decide if it's a cut diamond or a rough one that needs more editing to bring out its best. I have provided the titles for a large number of our books, & done major surgery on others. On several occasions we've had all the poems laid out on a table while we came up with an order that was symmetrical or thematic. We always produce the ‘guts' of the book before I attempt a cover design. Sometimes we create several alternative cover designs before we settle on one. My favorite question! How do you balance your time? I rise at 5 AM & by 6 or so I'm attending to literary work. I like to see the sun rise every day, & it inspires me. I have that kind of energy in the mornings, usually. It may be editing, correspondence, critical writing, or, if I feel really inspired, poetry. Poetry is the only thing that can hit me at any time of the day or night. Like most poets, I keep pen & ink nearby just in case. By 11 AM I'm ready to go outside. I have a group of friends that are mostly a decade younger, in their early fifties. I usually go out kayaking, hiking or fishing with a friend or two until 6 PM or so. After dinner, I may get a burst of new energy. Sometimes this means more literary work & sometimes it means more outdoor activities. I come inside at dusk & go to bed at 11 PM, usually. The literary work itself is probably 50/50 my own work balanced with other people's work or correspondence. When asked what surprised him about running a publishing house, James Laughton (New Directions) replied that he didn't imagine there would be so much correspondence. Also, reading manuscripts. We read hundreds of poetry submissions to the magazine. The magazine greatly complicates our lives, but it just seems somehow right to do it. Ultimately, small press publishing is an act of commitment & love. You edited an anthology called Inside The Outside - An Anthology of Avant-Garde American Poets. Talk about why you chose the work you did and speak in general about the anthology. We wanted to document the key players from the non-commercial, non-academic "small press movement" from its inception in the sixties mimeo scene to some of the emerging, non-traditional poets of the new millennium. At the beginning, the term ‘avant-garde' was applied to any independent poet publishing in the independent, non-subsidized presses. I still think it's a useful term, & I wanted to define it broadly again, putting experimental poets like Richard Kostelanetz, John Keene & Mark Sonnenfeld alongside poets like Doug Holder, A.D. Winans & Lyn Lifshin who push a different, more psychological or emotional envelope. My contributing editors Harry Smith, Hugh Fox & Eric Greinke, were instrumental in determining the final roster of poets. The goal was to demonstrate the scope that avant-garde poetry has achieved since the 50's Beat era, & to correct the perception that all small press poets are post-Beat in their styles & poetics. The work in Inside The Outside ranges from visual/conceptual to surrealistic, to modern epics, personal observation poetry to collage cut-ups. I wish we could have included a number of other poets who have made significant contributions, but we wanted to show each poet's range as well as the general range of outsider literature, both chronologically & qualitatively.